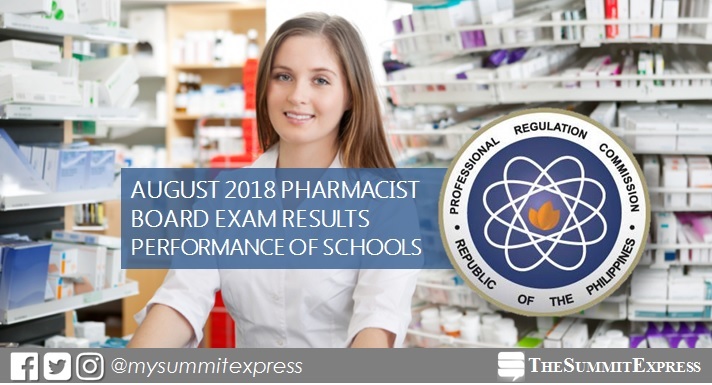 MANILA, Philippines – The Professional Regulation Commission (PRC) hailed the top performing schools in the August 2018 Pharmacist board exam. The results are expected to be released on Wednesday, August 8, 2018. Saint Louis University (SLU) topped the schools garnering 98.69% or 151 out of 153 examinees passed. It was followed by University of San Carlos (USC) with 96.72%, 59 out of 61 successfully hurdled the test. PRC conducted the second board exam for pharmacists this year on August 4 and 5 in Manila, all regional offices; Zamboanga. In the same period last year (August 2017), Saint Louis University led the schools with 97.27% or 214 out of 220 passed the exams. University of Santo Tomas ranked second with 92.50% or 296 out o 320 successfully hurdled the tests. In the June 2016 exams, San Pedro College - Davao City was the lone top performing school with 88.14% or 104 out of 118 passed the licensure exams.